Persistence Market Research (PMR) analyzes the FPS (Fire Protection Systems) market in its new publication titled “FPS (Fire Protection Systems) Market: Global Industry Analysis 2013–2017 and Forecast 2018–2026”. This study provides data for 2017 along with a forecast for the period 2018–2026. The main objective of the report is to identify the dynamics of the market and provide recent updates and insights that affect the various segments of the global FPS (Fire Protection Systems) market. To provide a better understanding of the FPS (Fire Protection Systems) market, the report also includes the analysis of global drivers, restraints and trends, which influence the current market scenario and are expected to impact the future status of the global FPS (Fire Protection Systems) market over the forecast period. To understand and assess market opportunities and trends, the global FPS (Fire Protection Systems) market report has been categorically split into different sections based on product type, end use and region. The report starts with an overview of the FPS (Fire Protection Systems) market and provides market definition & taxonomy, along with an analysis of the value chain and pricing analysis. It also sheds light on the drivers, restraints, and trends prevailing in the market. The sections that follow include the global FPS (Fire Protection Systems) market analysis by product type, end use and region. All the above sections evaluate the FPS (Fire Protection Systems) market on the basis of various factors affecting the market. Each section discusses the qualitative and quantitative aspects of the global FPS (Fire Protection Systems) market. To give a brief idea about revenue opportunities from the product type, end use and region segments, the report also provides the value of the FPS (Fire Protection Systems) market, absolute $ opportunity, and total incremental opportunity for each segment over the forecast period (2018 – 2026). In the final section of the report, we have provided the global FPS (Fire Protection Systems) market structure and a detailed competition landscape with company market share and performance to provide a dashboard view of key players operating in the global market along with their business strategies to report audiences. This is expected to enable clients to assess strategies deployed by market leaders and help them develop effective strategies accordingly. For market data analysis, we have considered 2017 as the base year, with market numbers estimated for 2018 and forecasts made for 2018–2026. To calculate the market size, the report considers the weighted average price of FPS (Fire Protection Systems) based on the product type across key geographies on a country basis. The forecast assesses the total revenue (US$ Mn) and volume (‘000 Units) of the global FPS (Fire Protection Systems) market. To deduce the market value, the cost of each product type has been considered. In order to provide an accurate forecast, we have started by sizing up the current market, which forms the basis of how the global FPS (Fire Protection Systems) market is expected to develop in the future. Critical market data, including the base number and segment splits, has been devised through in-depth secondary and primary research. This data is then triangulated on the basis of different verticals by considering supply side as well as demand side drivers and other dynamics of various regional markets, along with primary interviews of manufacturers and industry experts operating in the global FPS (Fire Protection Systems) market. The forecast presented in the report evaluates the actual cost of the different types of FPS (Fire Protection Systems) and the cost as per brands in the global FPS (Fire Protection Systems) market over the forecast period. We have also analyzed the different segments of the global FPS (Fire Protection Systems) market in terms of Basis Point Share (BPS) to understand the relative contribution of individual segments to market growth. This detailed level of information is important for identifying various key trends governing the global FPS (Fire Protection Systems) market. The report also analyzes the global FPS (Fire Protection Systems) market based on the absolute dollar opportunity. This is usually overlooked while estimating the market forecast; however, from a sales perspective, it is essential to identify the absolute dollar opportunity to identify potential resources in the FPS (Fire Protection Systems) market. PMR has developed a market attractiveness index to understand the key segments in terms of their performance and growth in the global FPS (Fire Protection Systems) market. This market attractiveness index is expected to help clients identify real market opportunities in the global FPS (Fire Protection Systems) market. The global FPS (Fire Protection Systems) market is estimated to be valued at US$ 41,735.1 Mn by the end of 2018 and is anticipated to reach US$ 83,507.3 Mn by the end of 2026 while expanding at a CAGR of 9.1% over the forecast period. The global FPS (Fire Protection Systems) market is anticipated to create incremental opportunity of US$ 41,772.2 Mn between 2018 and 2026. Due to the strong growth being witnessed by various industries, including mining, automotive, construction, manufacturing, utilities and petrochemical, demand for FPS (Fire Protection Systems) in the global market is expected to increase during the forecast period. Owing to these reasons, several companies are entering the market in Latin America, Asia-Pacific and Africa regions with an aim to exploit this demand and expand their geographical footprint. The global FPS (Fire Protection Systems) market in the emerging regions is expected to be driven by foreign direct investments in the industrial sector. According to the Global Finance Magazine, in India, the contribution of the industrial sector to the GDP of the country increased from 24.8% in 2012 to 25.8% in 2015. Thus, companies are focusing on developing FPS (Fire Protection Systems) which comply with the safety regulations of the domestic markets. 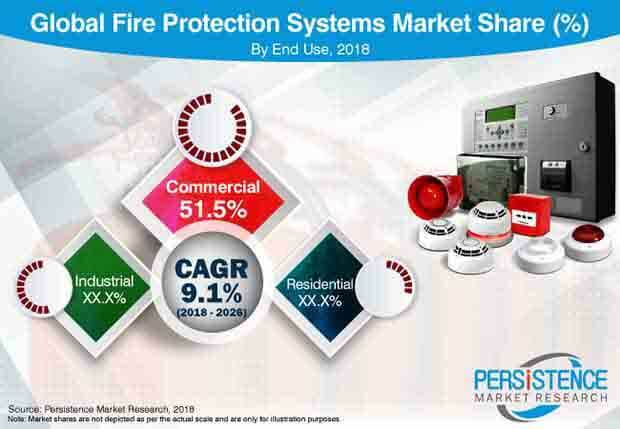 With effective research, development and innovation, the global manufacturers of FPS (Fire Protection Systems) will witness vast opportunities to capture the unexploited market and increase their market share in the FPS (Fire Protection Systems) market. Increased focus on safety will fuel the growth of FPS (Fire Protection Systems) during the forecast period. FPS are especially useful in extremely hazardous environments, such as oil & gas and chemical industries. Such industries are among the most safety-conscious end-user industries for FPS (Fire Protection Systems) equipment. Due to the high risks involved in upstream activities, this industry, globally, will create potential business opportunities for FPS (Fire Protection Systems) vendors in the global market. Within the oil and gas industry, workers are exposed to high risks of injuries and accidents. In the event of an accident, litigation costs and employee compensation costs are very high within this industry. Furthermore, loss of working days for each worker results in loss of productivity, which weighs heavily on the overall production of the company. Thus, abiding by the safety regulations and issuing suitable FPS (Fire Protection Systems) are considered wise investment decisions in the oil & gas & chemical industry. This particular factor is expected to pave way for potential revenue opportunities for the global FPS (Fire Protection Systems) market during the forecast period. By region, the North America FPS (Fire Protection Systems) market is estimated to dominate the global FPS (Fire Protection Systems) market. The Europe FPS (Fire Protection Systems) market is expected to hold around one-fourth of the market value share in the global FPS (Fire Protection Systems) market. Moreover, the South East Asia & Pacific region is estimated to remain a high growth market throughout the forecast period in the global FPS (Fire Protection Systems) market. It is projected to grow at a CAGR of 11.1% over the forecast period, predominantly owing to the vast presence of all industrial and commercial organizations. By product type, in terms of volume, the fire response system segment is estimated to lead the global FPS (Fire Protection Systems) market throughout the forecast period. Furthermore, in terms of value, the fire suppression system segment is estimated to dominate the market with almost one-half of the market value by 2026. The fire extinguishers FPS (Fire Protection Systems) market is expected to create incremental $ opportunity worthUS$ 4,545.7 Mn between 2018 and 2026 in the global FPS (Fire Protection Systems) market. PMR forecasts that the fire suppression system segment is projected to represent a compound annual growth rate (CAGR) of 10.1% from 2018 to 2026. By end use, in terms of volume, the commercial segment is estimated to be pegged at 313,188 ‘000 units in 2018. This segment is expected to grow at a CAGR of 6.0% between 2018 and 2026 in the global FPS (Fire Protection Systems) market. The Industrial FPS (Fire Protection Systems) segment is projected to create incremental $ opportunity of US$ 16,974.8 Mn over the forecast period. Some of the key market participants reported in this study of the global FPS (Fire Protection Systems) market are Gentex Corporation, United Technologies Corporation, Siemens AG, Robert Bosch GmbH, NAFFCO, GUNNEBO AB, Johnson Controls, Honeywell International, Hochiki Corporation, Halma plc, Consilium AB, DESAUTEL SAS, Yamato Protec Corporation, Swastik Synergy Engineering Private Limited and Solas Fire Safety Equipment (P) Ltd., among others. Solas Fire Safety Equipment (P) Ltd.